The use of the hook in angling is descended, historically, from what would today be called a "gorge." The word "gorge", in this context, comes from the French word meaning "throat." Gorges were used by ancient peoples to capture fish and animals like seal, walrus and birds. A gorge was a long, thin piece of bone or stone attached by its midpoint to a thin line. The gorge would be baited so that it would rest parallel to the lay of the line. When the game would swallow the bait, a tug on the line would cause the gorge to orient itself at right angles to the line, thereby sticking in the fish or animal's throat or gullet. Some laws and regulations require hooks to be barbless. This rule is commonly implemented to protect populations of certain species. A barbed hook could kill a fish if it were to penetrate the gills. 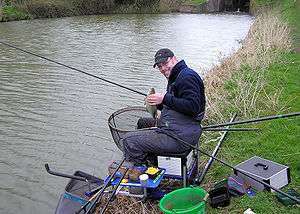 An angler on the Kennet and Avon Canal, England, displays his catch. Although most anglers keep their catch for consumption, catch and release fishing is increasingly practised, especially by fly anglers. The general principle is that releasing fish allows them to survive, thus avoiding unintended depletion of the population. For species such as marlin and muskellunge but, also, among many bass anglers, there is a cultural taboo against killing bass for food. In many parts of the world, size limits apply to certain species, meaning fish below a certain size must, by law, be released. It is generally believed that larger fish have a greater breeding potential. Some fisheries have a slot limit that allows the taking of smaller and larger fish, but requiring that intermediate sized fish be released. It is generally accepted that this management approach will help the fishery create a number of large, trophy-sized fish. In smaller fisheries that are heavily fished, catch and release is the only way to ensure that catchable fish will be available from year to year. 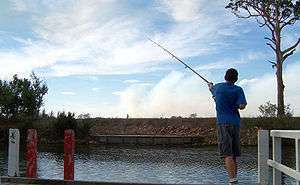 The practice of catch and release is criticised by some who consider it unethical to inflict pain upon a fish for purposes of sport. Some of those who object to releasing fish do not object to killing fish for food. Adherents of catch and release dispute this charge, pointing out that fish commonly feed on hard and spiky prey items, and as such can be expected to have tough mouths, and also that some fish will re-take a lure they have just been hooked on, a behaviour that is unlikely if hooking were painful. Opponents of catch and release fishing would find it preferable to ban or to severely restrict angling. On the other hand, proponents state that catch-and-release is necessary for many fisheries to remain sustainable, is a practice that generally has high survival rates, and consider the banning of angling as not reasonable or necessary. 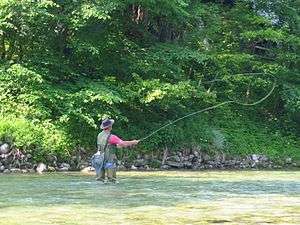 ↑ "Fishing limits - What is a slot limit?". Florida Fish and Wildlife Conservation Commission. Retrieved 20 October 2011. ↑ Yeong Nain Chi Socioeconomic Research and Development Section Louisiana Department of Wildlife and Fisheries. "Segmenting Fishing Markets Using Motivations" (PDF). e-Review of Tourism Research (eRTR), Vol. 4, No.3, 2006. Retrieved 2009-05-06.